Covve: The smartest, simplest address book app. 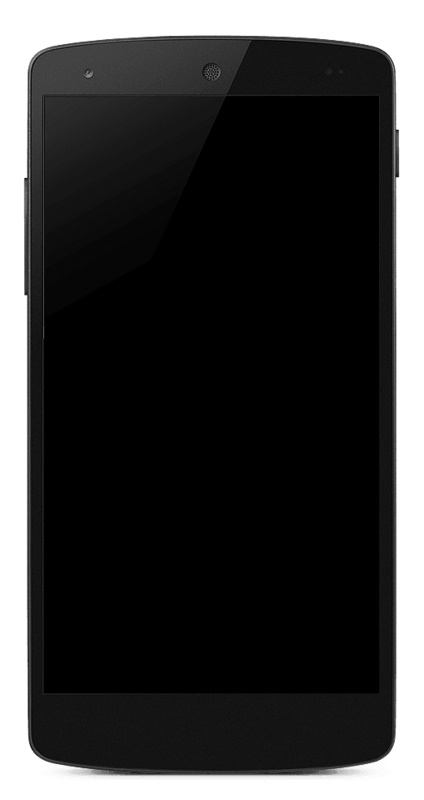 This simple yet state-of-the-art app will revolutionise your business relations like you've never seen. Looking for the perfect excuse to reach out? Be the first to hear of news affecting your contacts. 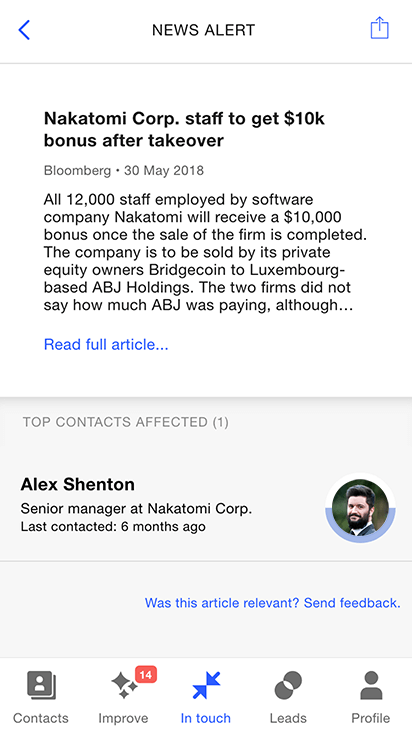 Covve’s AI-powered News Engine scans far and wide to find news affecting your contacts and serves it to you, curated and in time! 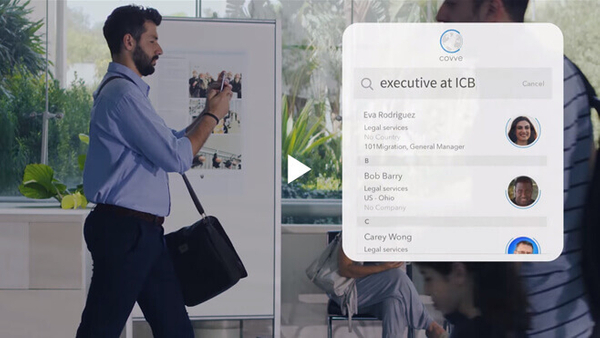 Covve automatically fills-in missing contact details such as location, industry, company, seniority, avatar, social profiles and removes duplicates. Contacts all over the place? Tag and categorize important contacts, favorite your warmer contacts for quick access and archive those pizza places. Forgetting to stay in touch? 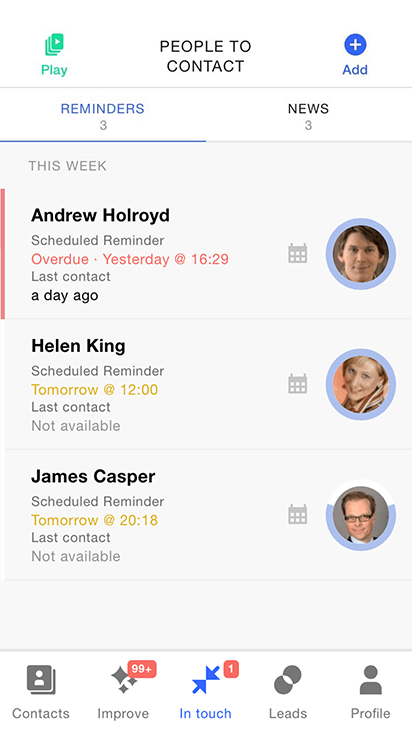 Specify how often you want to stay in-touch, and automatically get reminded on who to contact. Never lose touch again and stay warm with those who matter most. Don’t have a smart way to manage contacts and clients? Record any communication like call, text, email, face-to-face. 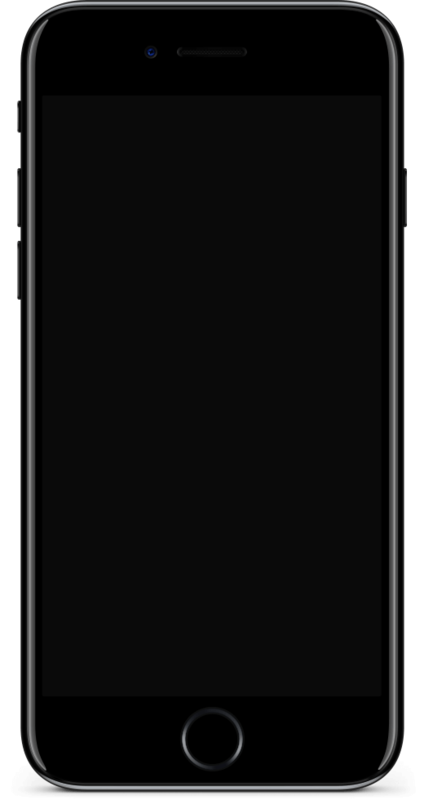 Add notes against each call, schedule follow-up calls, review your comms before your next call and always be prepared. Build your private contact network. Find who can refer you by sharing what type of people you know. Names and contact details are never shared. Thousands of warm leads will become accessible through search and Covve maps. "I’ve been using Covve for a while now and it is simply a superb contact management system and a superb app to accompany it! 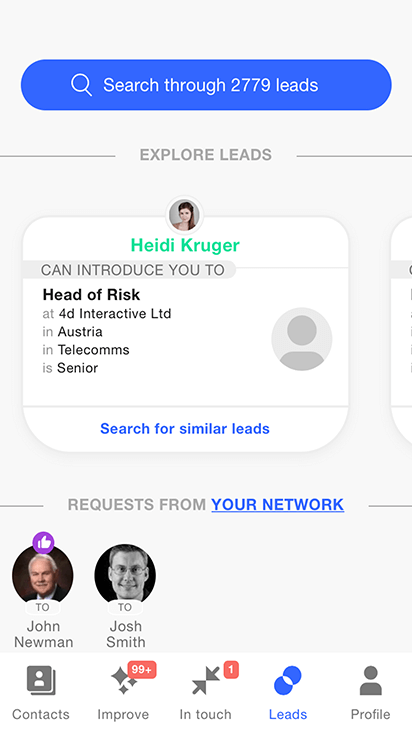 It allows us to have a better visibility of our company’s contact network and it’s our first point of call when looking for a contact in a specific company." 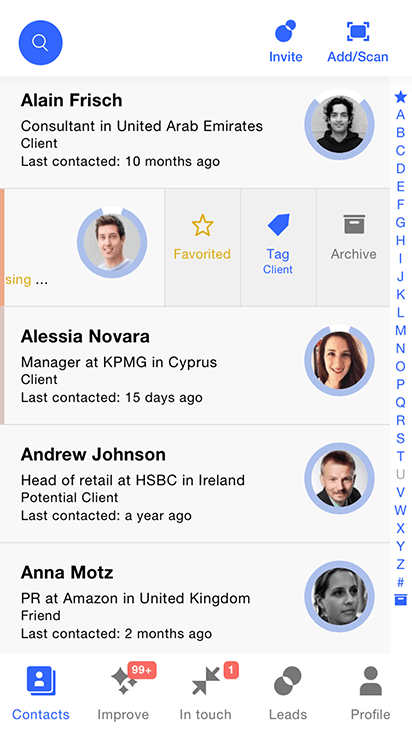 "A polished address book app which guides me to make better use of my professional contacts. Great with reminders and a nice tool to support Business Development efforts as well." "I use the Covve address book app and the online maps to visualize my contacts network. It’s particularly helpful to view and export contacts in specific countries or industries. Covve also did a great job at enriching my contacts automatically." Vahid Basset, Head of Marketing, QUBE Events. "I love how Covve combines commonly used features in one app. 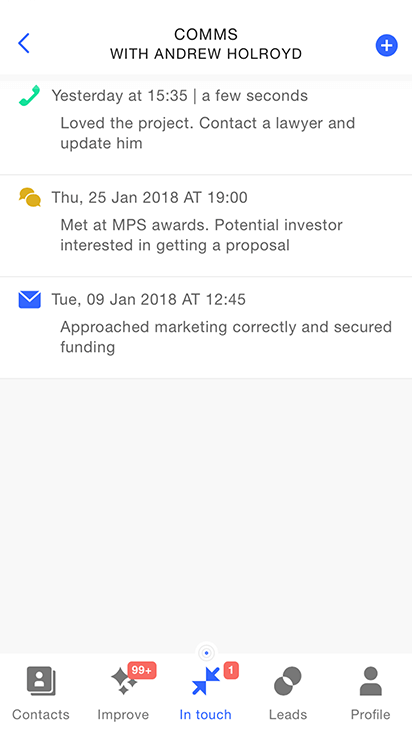 I can now see my contacts, add notes, keep a log and get reminders all in one place. A great business tool that I use on a daily basis. Also great to see new features added regularly! Keep it up!" Peter Kkolas, Civil Engineer, Owner, P.K. Connection. "Your app is the best app I have found by far (and I’ve searched dozens) for maintaining personal relationships. It’s had a huge positive impact on my own personal relationships." Kevin Packer, Product Manager, Infuse. "I am already using ZOHO (not good for mobile) and I have compared both Salesforce and OnePage to yours. You rule!" Christos Emmanouilidis, Corporate Executive and Danaos Management Consultants, UAE. We believe that the address book is one of your most valuable assets, and Covve has been designed to protect it and empower you as its gatekeeper. Industry standard 256-bit SSL encryption. All server data is backed up near real time. We regularly seek external security expertise to review our systems. You’re minutes away from transforming your address book!